Mark Berman was born in Sydney, New South Wales on 16 December, 1951, the only child of Holocaust survivors from Poland. Mark’s father completed a PhD in chemistry at the Free University of Brussels in 1931. When he arrived in Australia in 1948, only PhDs from the USA and the UK were recognised in Australia. So Mark’s father was unable to practice his chosen profession in Australia. His mother, somewhat younger than his father, was only 16 when World War II started and was unable to complete her education. After arriving in Australia, they started selling menswear and later ladies wear, and built up a successful business in this industry. They also spent much of their time helping Mark with his education. His education started at Bellevue Hill Primary School and then at Woollahra Opportunity School. He then attended Randwick Boys High School followed by Vaucluse Boys High School, where he became School Captain. He obtained a BSc with First Class Honours and the University Medal in Statistics from the University of New South Wales (UNSW) in 1974. This was followed by a Master of Statistics from the same institution in 1976 and a PhD in mathematical statistics from Imperial College, University of London in 1978. Mark’s PhD was undertaken under the eminent statistician Professor (now Sir) David Cox, FRS. Most of Mark’s professional life has been with CSIRO, starting with the Division of Mathematical Statistics (DMS) and now with the Division of Computational Informatics. Mark started his CSIRO employment as a vacation student during the 1972-73 summer holidays, working under Dr. Alan Miller. He enjoyed the combination of theory and application that he experienced there so much that he decided that CSIRO was the ideal place for him to pursue a scientific career. 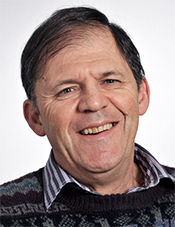 After completing his Honours year, Mark was a tutor in the Department of Mathematics at UNSW, and rejoined CSIRO Division of Mathematical Statistics in late 1974. In those days, DMS (by that time renamed the Division of Mathematics and Statistics) existed to make applied mathematical and statistical contributions to the research of other CSIRO scientists. All DMS scientists were allocated to work with one or two other CSIRO Divisions. Mark was allocated to work with the then Division of Mineral Physics for a maximum of 12 months, on condition that he enrolled for a PhD afterwards. During this period, Mark started working with Australia Prize winners, Andy Green and Jon Huntington, who have been his most significant collaborators during his years at CSIRO. Mark left for London to undertake his PhD in August 1975. After completing his PhD, Mark spent the 1978-79 academic year teaching in the Department of Statistics at the University of California, Berkeley. He rejoined CSIRO Division of Mathematics and Statistics as a Research Scientist in August 1979. He has spent all except one year since then with CSIRO, where he is now in 2013, a Senior Principal Research Scientist. He took a year’s leave in early 1988 to found and lead the Image Processing and Data Analysis Group at BHP’s Melbourne Research Laboratories. ImageXPress®, an image analysis system developed for the rapid screening of pharmaceutical drugs with Axon Instruments (subsequently acquired by Molecular Devices). Mark led the software team within the RoadCrack project and he managed CSIRO’s involvement in the ImageXPress project. In recent times, he has taken short periods of leave from CSIRO to give PhD courses in spectroscopy and hyperspectral imaging at the Technical University of Denmark (2007) and Stanford University (2008). He will give an updated version of his course at Stanford in 2014. Mark’s primary research interests have evolved over his career, starting with multivariate point processes, then in image analysis, especially in multispectral and hyperspectral image analysis and the associated area of spectroscopy. Point Processes ‘ Mark’s PhD research (1975 ‘ 78) was in the area of multivariate point processes. A point process is a series of (essentially) â€œpointâ€ events in time or space. For instance, the arrival and/or departure times of bank customers or of vehicles passing various points of interest (e.g. traffic lights) to traffic authorities. A knowledge of the distribution of inter-event times helps businesses and government authorities to optimise the number of bank tellers or traffic light intervals at various times of the day and week. A multivariate point process is one where there are several types of point events (e.g. arrivals and departures). During the early years of Mark’s collaboration with Andy Green and Jon Huntington, he became interested in spatial point processes. This was specifically motivated by the question: are certain types of minerals more likely to lie closer to fault lines than one would expect to occur by chance? Mark carried out research to enable this question to be answered. Mark’s research has been in both the modelling of point processes and statistical inference associated with these models. During his first 15 years with CSIRO, he published a number of papers in various aspects of point processes. Several of them are highly cited. Spectroscopy, Multispectral and Hyperspectral Imaging ‘ Spectrometers measure the amount of light that a material reflects, absorbs, transmits, scatters or fluoresces at many (usually hundreds of) wavelengths in the visible, ultraviolet and/or infrared parts of the electromagnetic spectrum. This information (often itself called a â€œspectrumâ€) tells us a lot about the chemistry of the material. If there are enough measurements at appropriate wavelengths, spectroscopy can be used to discriminate between different types of materials. A multispectral image consists of a spectrum containing a small number of measurements at each pixel . For instance, Landsat Thematic Mapper (TM) is a well known satellite, whose sensors produce measurements in the red, green, blue and three infrared wavelengths. A hyperspectral image consists of hundreds of measurements at each pixel. For instance, NASA’s AVIRIS instrument records spectra at 224 wavelengths in the visible and infrared. There are now also hyperspectral microscopes. Most pixels actually contain a mixture of materials. If there are enough measurements at appropriate wavelengths, not only can different types of materials be discriminated, but often the constituent materials in a mixture can be identified. Since the early 1990’s, Mark’s research has primarily focussed on â€œunmixingâ€ spectra into their constituent parts. There are two basic unmixing problems. In the first type, one has a library of the spectra of pure materials, and this information is used to unmix the spectra of mixtures. Mark and CSIRO colleagues have developed a sophisticated algorithm to do this. It is coded in a software package called The Spectral AssistantTM (TSA®). TSA is at the heart of a commercial CSIRO package called The Spectral Geologist ®, which is widely used in the mining industry. In the second type of unmixing problem, no library of pure spectra is available, and one needs to estimate what these are from a large number of mixed spectra (typically available in a multispectral or hyperspectral image), some of which are pure or almost pure. This is sometimes referred to as â€œblindâ€ unmixing and the purest spectra in a data set are often called â€œendmembersâ€. Mark is the primary author of a patented blind unmixing algorithm called ICE (â€œIterated Constrained Endmembersâ€). The original paper about ICE is widely cited. An important issue arising in hyperspectral imaging is compression. This makes storage and processing of these large images more efficient and faster. Although a typical hyperspectral image may have several hundred spectral dimensions (each of which can be represented as a separate image), the number of distinct materials in the region covered by the image will often be between 10 and 20. The widely used Principal Components transform is often used to compress hyperspectral images into a smaller number of images, which aim to represent the distinct materials. Mark and colleagues have developed a superior transform called the Minimum Noise Fraction (MNF) transform to do this job. Their two papers on this transform are very highly cited. The ICE unmixing algorithm is designed to work in MNF space. Most of Mark’s research in this area has been motivated by problems in mineral exploration, using data from satellites, aircraft and drill cores. However, he has also worked on hyperspectral applications in biotechnology, and in more recent times on continental scale mapping using Landsat TM data for environmental and agricultural applications. Mark is the co-author of a number of patents, mostly in relation to the RoadCrack system and the ICE unmixing algorithm. 2011 â€œBest Applicationâ€ paper published in the Journal of Chemometrics in 2009 and 2010 ‘ about the ICE unmixing algorithm. Professor Sir David Cox, FRS (http://en.wikipedia.org/wiki/David_Cox_(statistician)).